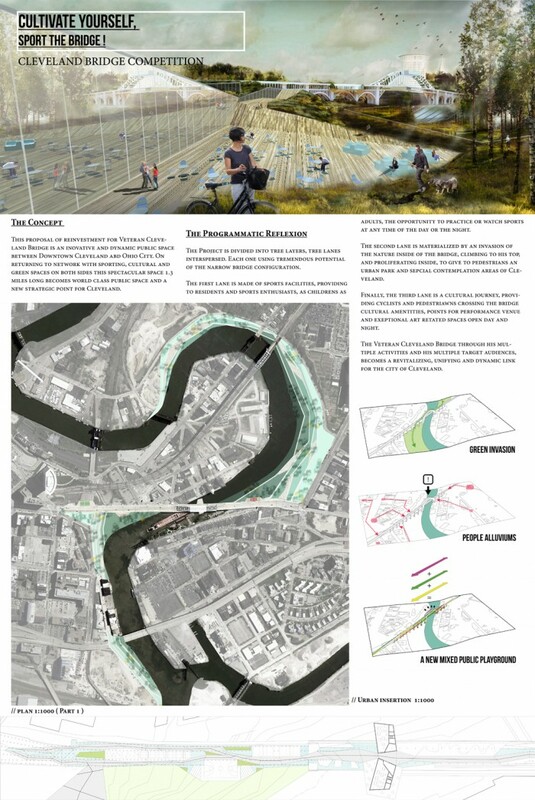 Overview: This proposal of reinvestment for Veteran Cleveland Bridge is an inovative and dynamic public space between Downtown Cleveland and Ohio City. On returning to network with sporting, cultural and green spaces on both sides this spectacular space 1.3 miles long becomes world class public space and a new strategic point for Cleveland. 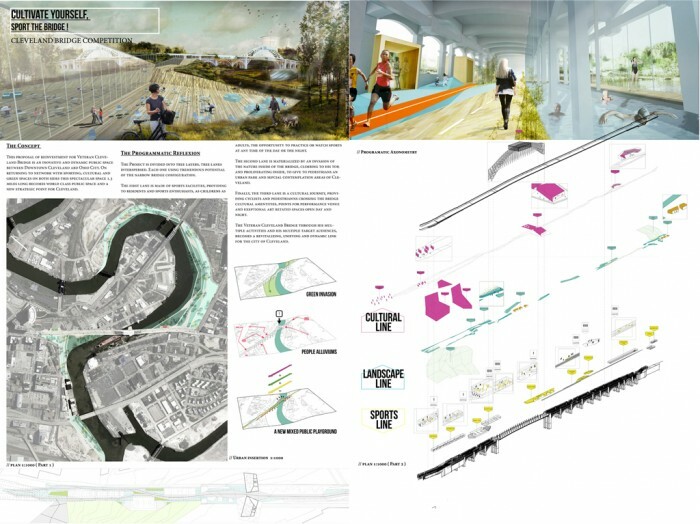 The Project is divided into tree layers, tree lanes interspersed. Each one using tremendous potential of the narrow bridge configuration. The first lane is made of sports facilities, providing to residents and sports enthusiasts, childrens as adults, the opportunity to practice or watch sports at any time of the day or the night. 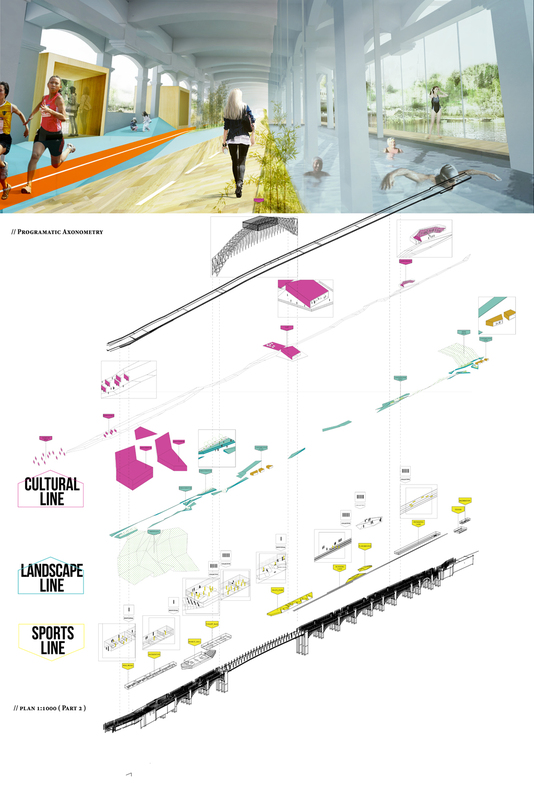 The second lane is materialized by an invasion of the nature inside of the bridge, climbing to his top, and proliferating inside, to give to pedestrians an urban park and special contemplation areas of Cleveland. Finally, the third lane is a cultural journey, providing cyclists and pedestrians who want to cross the bridge some cultural amentities, points for performance venue and exeptional art spaces open day and night. The Veteran Cleveland Bridge through his multiple activities and his different target audiences, becomes a revitalizing, unifying and dynamic link for the city of Cleveland.